Within the pages of Rev. Dr. Sharon L. Gottfried Lewis’s new book, Healing School Level 1 Workbook - A Course in Inner Healing, ($14.99, paperback, 9781498476119) readers begin an exciting journey with God to be trained as an Amazing Love Healing prayer minster – a journey that introduces or furthers one’s training in healing. Thousands have attended Amazing Love Healing Ministry conferences, schools of healing, and private appointments. This course, now being offered to readers of this book, provides specific teaching in seven basic areas of healing. It also provides experiences for the reader’s personal healing and an opportunity for participating in the healing of others. This is must-have resource on inner healing is needed in every church and in every family – brings healing through Jesus Christ to the wounded and broken-hearted. The author encourages people to know their life should not be dictated by hurtful past events. She explains that God can heal the pain of unhealed wounds. The journey of healing that readers will embark on will be life changing and possibly life-giving. 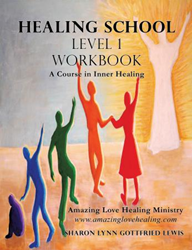 This workbook also corresponds to the author’s published DVD teachings on Healing School Level I. The Rev. Dr. Sharon L. Gottfried Lewis has twenty-five years of experience in Christian healing ministry. Currently, she is Executive Director and Founder of Amazing Love Healing Ministry and an Episcopal priest in Southwest Florida. She holds an earned Doctorate of Ministry from Trinity School for Ministry, Ambridge, PA; a Masters of Divinity from the University of the South, Sewanee, TN; a Masters of Counseling/Psychology from Nova University, Ft. Lauderdale, FL; and a Bachelor of Arts degree in Education from University of New Jersey, Trenton, NJ. However, her most important credential is her love for God and His people. Xulon Press, a division of Salem Media Group, is the world’s largest Christian self-publisher, with more than 15,000 titles published to date. Retailers may order Healing School Level 1 Workbook - A Course in Inner Healing through Ingram Book Company and/or Spring Arbor Book Distributors. The book is available online through xulonpress.com/bookstore, amazon.com, and barnesandnoble.com.